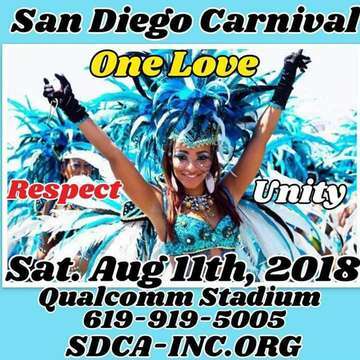 San Diego Caribbean Association so is excited to bring to you it's 2nd Annual San Diego West Coast Multicultural Carnival & Festival at SDCCU Stadium (formally Qualcomm Stadium) on Saturday August 11th, 2018 from 12noon- 10pm. There will be various delicious cultural food stands, vendors, international artist and you do NOT want to miss the Parade of the Bands that will feature hundreds of Masqueraders in costume. This event will be both epic and historical.